As always with my Reviews En Bref, I’ll give you a summary of my impressions of a perfume that — for whatever reason — didn’t seem to warrant a full, exhaustive review. If a colour or fragrance were to be associated with each day, like the planets were in ancient times, sandalwood would be the Sun, saffron would be Jupiter, and without doubt vanilla would be Venus. Spiritueuse Double Vanille opens on me in a way that is really true to its notes. There is an immediate burst of rose, bergamot and incense, followed quickly by pink peppercorn. The bergamot isn’t like Earl Grey tea but, rather, more like petitgrain: the woody-citric distillation of twigs from a citrus tree. The rose is heady, sweet, rich and dark. A definite damask rose. There is obvious vanilla throughout, strongly evoking long, freshly sliced Madagascar beans or concentrated vanilla extract. It leads to a very boozy smell, tinged with florals and some incense notes. The latter is particularly lovely, as the smoke is not bitter or smoky. Rather, it’s sweet and rounded. It’s a perfect counterbalance to the rose. Ten minutes in, the rose fades just a little, leaving a definite impression of an apple pie soaked in vanilla ice-cream with rum sauce. Twenty minutes in, a subtle, quiet cedar note emerges. It’s not camphorous, but fresh and dry, like a new cedar chest of drawers. Despite the subtle wood note, the overwhelming impression is of apple pie and hookahs (or water pipes). And that is why this is such a short review. I feel as though I’ve been down this road before: Spiritueuse Double Vanille reminds me almost exactly of Hermès‘ 2004 Ambre Narguilé. There are a few, very small, extremely minor differences but, all in all, I feel as though I could essentially just repeat large chunks of my review of Ambre Narguilé here, and be done with it. They are both incredibly boozy, rich scents with fruity tobacco and swirling incense, smoke notes that evoke a hookah. I’m hardly the only one who has noted the incredibly strong similarity. Birgit from Olfactoria’s Travels said the same thing, and there are numerous Basenotes threads comparing the two (along with Tom Ford’s Tobacco Vanille). As noted up above, Spiritueuse Double Vanille is often compared to Tom Ford‘s Tobacco Vanille. I have not yet tried the latter (though it is becoming increasingly apparent that I need to move my sample up on my list of things to review), but, again, there are supposed to be differences. This time, however, the differences are said to be quite stark. From what I’ve read on Basenotes and elsewhere, Tom Ford’s perfume is supposed to be brash and assertive — Spiritueuse Double Vanille on steroids, if you will. Guerlain’s perfume is said to be perfect for those who find the Tom Ford to be too much. As a side note, I’ve also read of a third perfume to which the Guerlain can be compared: Bond No. 9‘s New Haarlem. I have no familiarity with that one, either, but, if you’re interested, you can read a discussion comparing all four scents on Basenotes. Anyone who has bought vanilla in pods knows that they do not smell very good up close, with dissonant fruity, rum-like notes that make you feel like skipping lunch. Guerlain obligingly magnifies all the negative traits of vanilla in this pointless, loud, and misconceived confection. On Fragrantica, the criticisms of Spiritueuse Double Vanille seem to fall into two, related camps. First, that it is a linear scent of simple, boozy, vanilla extract. Second, that it is too expensive for what it is. 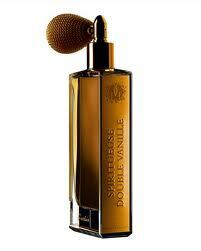 Spiritueuse Double Vanille comes in only one size (2.5 oz/75 ml) and costs $250. I think price is, ultimately, a very subjective, personal thing, so I won’t comment on that. With regard to the other criticism, I don’t think SDV is a one-note scent and, on me, it’s certainly more than just plain vanilla extract. But, even if it were, I believe linearity is only a bad thing if you absolutely hate the note(s) in question. The sillage and longevity of Spiritueuse Double Vanille is impressive. There was a scent bubble for about four hours, after which it became closer to the skin. All in all, it lasted about 8.5 hours on me. On others, it is said to last all day, though it is not the “beast” that is Tobacco Vanille. 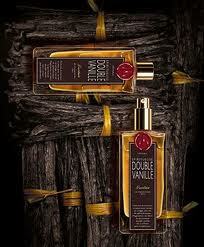 If you like comforting, warm, sweet and boozy scents, I think you should give Spiritueuse Double Vanille a try. It’s not earth-shattering, but it is very cozy and I suspect some may find it wholly addictive. Cost & Availability: Spiritueuse Double Vanille costs $250 for 2.5 fl. oz/75 ml. It is available at Guerlain boutiques, and on its website. It is also available on the Nordstrom website and, apparently, in the store. It is shown on the Neiman Marcus website (where it is priced at $225), but there is a note saying that it is not available; the same story applies to Bergdorf Goodman. (I don’t know if it is available within the stores themselves.) For all other countries, you can use Guerlain’s Store Locator on its website. If you’d like to give SDV a test sniff, you can get a sample from Surrender to Chance where prices start at $4.99 for half of a 1 ml vial. This entry was posted in Fragrances, Guerlain, Perfume Review, Reviews En Bref, Vanilla Fragrances and tagged Ambre Narguile, Bon No. 9 New Haarlem, Guerlain, Guerlain perfume, Guerlain perfume review, Guerlain Spiritueuse Double Vanille, Hermes Ambre Narguile, Hermes Ambre Narguile perfume review, Jean-Paul Guerlain, perfume review, Spiritueuse Double Vanille, Spiritueuse Double Vanille perfume review, Tom Ford Tobacco Vanille, Vanilla by Kafkaesque. Bookmark the permalink. Nice review Kafka and yet another perfume my eyes have never seen and my nose have never smelled. One of those days when I become a well known perfumer I will travel around the globe and smell everything I couldn’t smell at the age I’m now. Geography is one of my biggest problems. hope you’ll be able to discover my perfume one day. Or at least my collaboration with another perfumer. I wouldn’t mind doing a Seville a L’Aube kind of collab. I love vanilla and rose- I may give it a shot. Hmmmm, I’m not sure about this – it *does* sound comforting, but at $250 it’s not really piquing my interest! I’ll smother myself with a few apple pies and tubs of ice cream for that price, plus I could eat it too. 🙂 I feel like for $250, it has to make a lasting impression, at least for the wearer. Speaking of comfort scents, I’ve really come around on Lagerfeld. That is a pure comfort scent to me, and I like it exponentially more each time I wear it. It’s a little “much” for my taste (much of what, I’m not 100% sure of…sweetness, maybe? ), but it was so perfect for a night at home on a bitterly cold day. I’ve really grown to enjoy it in a way that I wouldn’t have thought was possible when I first tried it. I certainly smell more than powder these days, which is all I could smell the first few times I tried it! As for the KL, I’m thrilled. Utterly THRILLED!! Especially by the fact that you can smell more than powder. You know how I’m *not* a fan of the note, so I would hardly adore the Lagerfeld as much and as intensely as I do were it a pure powder scent! What do you smell now that you didn’t before? (I suspect it’s due to the evolution of your nose in the time since you first bought it.) If you get the chance to pull up the original post (things are all categorized now by brand), you can tell me there when you have the time. Ah, yes! I remember I had read a rave review for it somewhere before but couldn’t quite remember where. Sigh, I need to start cultivating an updated list of things I am tempted to try. I will likely be placing a LuckyScent order very soon, so I’m trying to choose expensive ones in the hopes they send a few of them. LOL. Yes, I will definitely write more about Lagerfeld on that post! P.S. Kudos for sorting by brand – there has been more than one occasion where I have been looking for a previously written review and this will make it easier! I love this fragrance. It is worth the price and is smooth and rich and just wonderfully vanilla without being sickly sweet. I never understood the comparison between this and Tom Ford Tobacco Vanille as TF shouts and grows obnoxious over time. It’s very much an 80’s powerhouse fragrance and not in a good way! I thought of you the whole time I was wearing it, Mr. Hound!! It’s a lovely smell. I just think it’s bloody close to Ambre Narguilé. Almost virtually identical in most part. The minor differences edge that one out for me, but really, I could be very happy wearing SDV too! As for TF, it seems to me thus far that almost all his scents are very much 80s powerhouses. While I normally like the latter, there can be times when it’s just too, too much. Plus, truth be told, I don’t really see you as a Tom Ford man, though Noir de Noir would be an exception out of the things I’ve tried thus far. You are right, I’m not a TF guy, I’m much too subtle for him 🙂 Althought I have never smelled Noir de Noir so I can’t speak to that. I hope those aren’t the same people who compare SDV to both Ambre Narguilé and Tobacco Vanille. For me all three are as similar as can be any perfumes that have a note or two in common – not more. I don’t have enough experience with SDV: dab vial scews the testing versus spray and especially if it’s a spray of Tom Ford’s perfume but I thought those two were very different and SDV was much smoother (and I like TV so I cannot be subjective towards SDV). I think people are comparing things out of general similarity of categories but, with the exception of Ambre Narguilé, no-one is saying that anything is really close. The Tom Ford is repeatedly said to be the brash, intense, high-powered, version of SDV. SDV on steroids and amped up, or “Tobacco Vanille Lite.” So, yes, people say that they’re very different. The Ambre Narguilé, though, that is where the similarities lie for many hours in both perfumes’ development and until the very end when they change in character. It’s at the end when one is amber and one is vanilla that the differences are stark, though as I noted there are subtle differences before that as well. Some people also seem to think the Bond No. 9 New Haarlem is similar, though others talk about a difference in quality. I tried this one but wasn’t really impressed with. It is good but not great. I agree with you that there are more compelling amber based fragrances out there. I love boozy vanilla too. Just out of curiosity, have you ever tried Hermès’ Ambre Narguilé? I’ve got a sample of this over the holidays. Now that I read your review I am compelled to try it. Tobacco Vanille has a monstrous projection. It is one of the fragrances I wear when I feel like standing out and being noticed. Give it a try and let me know what you think. I’m curious. I haven’t tried SDV yet, but I I’m not sure i want now to be honest. I can’t stand Amber Narguile for its sickening sweet apple pie scent, which with time becomes even more sweet and gives me headache. TV on the other hand is strong and projects strongly but it’s not cloying like AN(due to tobacco and dry fruit note) and it shines in cold weather. I don’t wear TV often but when I do I get lots of compliments.